First things first: thank you to everyone who entered last week’s giveaway. I really enjoyed your responses- what healthy, creative people you are! To impartially choose a winner, I used the super-technical method of writing names on slips of paper and having a coworker choose one before lunch. All documented on high-quality iPhone video. 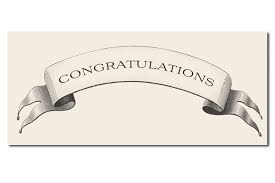 Congratulations Diana, winner of the My Coconut Kitchen coconut butter sampler pack! I hope you enjoy the sumptuous spreads as much as I do- let us all know how you use them. Thank you to My Coconut Kitchen for the prize- be sure to check out Angie’s delicious inventory! This week, I was looking for a meatless recipe with simple, clean flavors that would fill me up, create leftovers, and be relatively simple to prepare. I was short on time and motivation and long on hunger, so who did I turn to? Heidi Swanson, author of Super Natural Every Day, a wonderful cookbook given to me by a wonderful aunt. My last Heidi Swanson post brought us another delicious meatless dinner- white beans with cabbage. Heidi’s broccoli gribiche recipe is listed in Super Natural Every Day under “lunch” and would be a showstopper at a picnic or potluck. I know it was a big hit at my one-woman potluck. Here it is! Broccoli gribiche. Preheat your oven to 400 degrees and arrange two racks in the middle and top of the oven. Wash the potatoes and chop any potatoes larger than your thumb in half. Do not chop your thumb in half, only thumb-sized potatoes. Toss the potatoes and any thumb bits with one tablespoon of the olive oil and a large pinch of kosher salt in a large bowl; turn the potatoes out into a single layer on a baking sheet and roast on the middle oven rack for the first 15 of 30 minutes. Set the bowl aside. While the potatoes cook, hard boil your eggs. You can find a foolproof allez! gourmet hard-boiling method here if you need it- super, super easy. While the eggs cook, wash and chop your broccoli and toss with another tablespoon of olive oil and another pinch of salt in the large bowl. 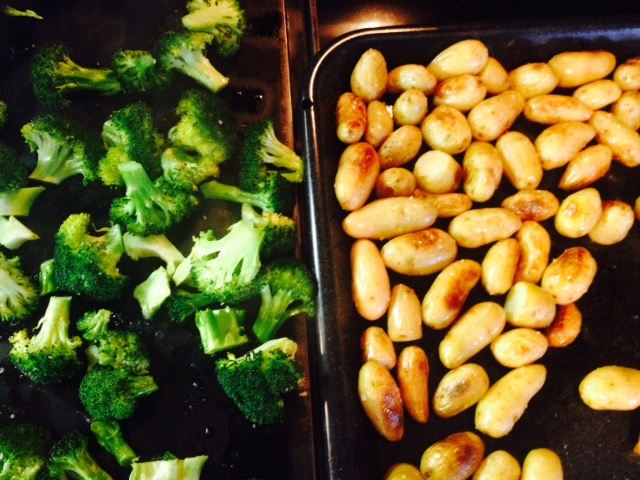 Once the potatoes have cooked 15 minutes, stir the potatoes, turn the broccoli out onto a separate baking sheet and place the broccoli on the top rack of the oven, roasting the potatoes and broccoli another 15 minutes. You can set both baking sheets aside when the roasted veggies are done. Back to the eggs: let your hardboiled eggs cool in ice water for speedy cooling and to prevent rings around the yolks. Peel one, remove its yolk, and mash that yolk in the trusty, large bowl you used for the potatoes and broccoli. I’m saving you dirty dishes here. My husband would be proud. 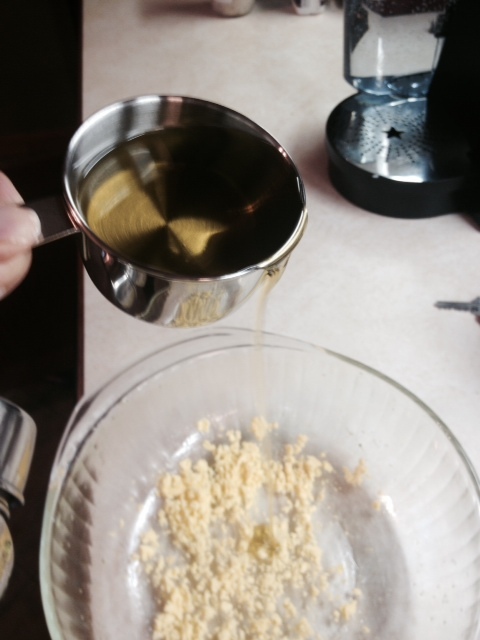 Verrry sloooowly whisk the 1/4 cup olive oil into the mashed egg yolk, emulsifying the mixture. It will be a lovely, velvety, glossy yellow. a!g action shot! bam! pow! Whisk in the mustard and then the vinegar. 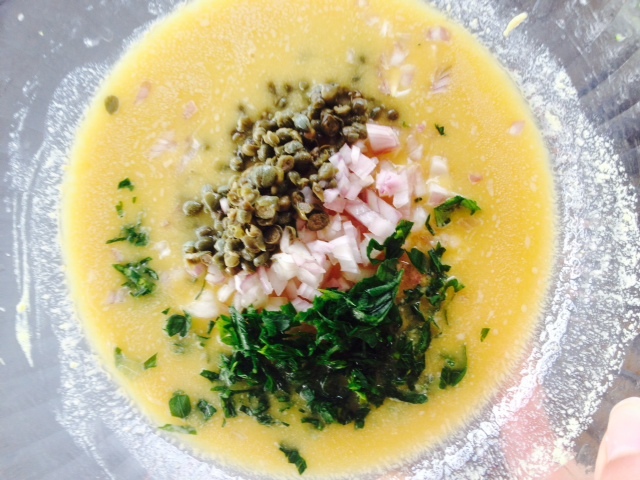 Add the shallots, capers, and herbs, mixing the gribiche well. Chop the remaining 3 1/2 eggs and gently fold them into the mixture. Now for the fun part- combine the potatoes and broccoli in an an even larger bowl and add the dressing, gently tossing everything to coat. Serve. This stuff is seriously delicious, reheats very well, and can be served cold or at room temp. The flavors of the dressing were even better the next day, having had some time to mix and mingle overnight. Cheeky devils. 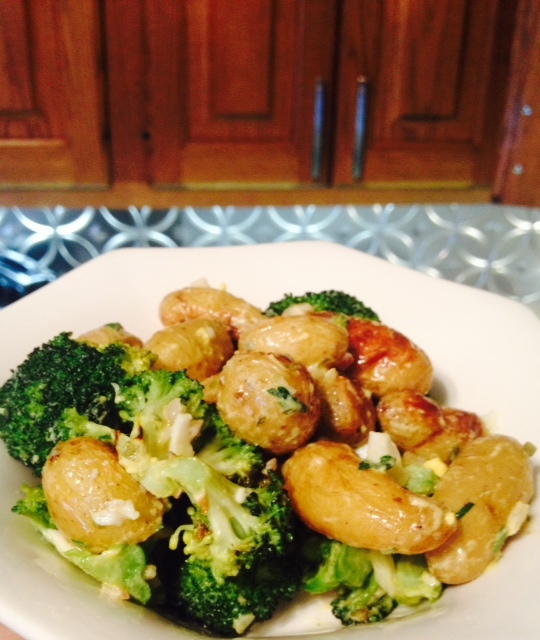 I paired mine with Trader Joe’s new cruciferous crunch mix, braised in olive oil with a bit of red wine vinegar. Enjoy! Harkening back to March of last year, here’s an allez! gourmet recipe for a classic Spanish potato salad, Ensaladilla Rusa. 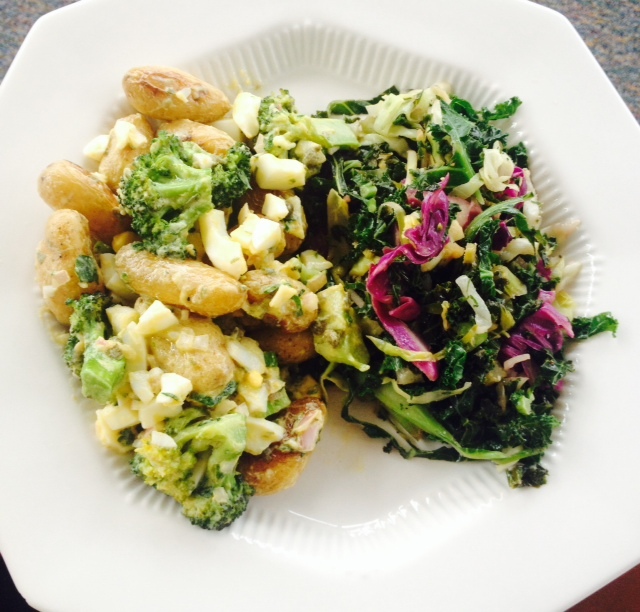 This entry was posted in Classics, Dinner, Easy, Eggs, Fancy, Fast, Gluten free, Salad, Side Dish, Vegetarian and tagged broccoli gribiche, gribiche, healthy potato salad, Heidi Swanson, meatless mondays, potato salad with broccoli, warm potato salad. Bookmark the permalink.